The pace of Arachnolingua development has picked up a bit. After adding the first set of annotations for a non-NCBI taxon (Leucauge mariana in a courtship description in Eberhard and Huber (1998) – a rich source of annotatable material), the need to support these curator added taxa more completely became obvious. The curation side was filling in the details for such taxa – the hook was already there to make a term, but it was not identified as to being a taxonomic name or its source authority (in this case the World Spider Catalog). That would suffice to make it available as a taxonomy term, but I also needed to add a mechanism to add one or more levels of parentage to connect the term to something already in NCBI. Fortunately in the case of L. mariana, the parent genus was in NCBI so chaining wasn’t required. Actually linking via parents was not strictly necessary for the curation process – it just needs to capture the parentage to pass to the OWL generation tool. Before I finished those changes, the OWL generator created a number of knowledge base files that attached L. mariana to the root OWL term. This has been finished and L. mariana and a small subset of the behavior patterns documented by Eberhard and Huber are now annotated in Arachnolingua. I also followed through on a long overdue change that rippled throughout the implementation. I have been using the term ‘assertion’ throughout the code to refer to a conjunction of taxon, behavior, body part, publication, and eventually evidence. The problem with calling these ‘assertions’ is simply that the OWL specification talks about assertions that are much smaller – an Arachnolingua assertion can be decomposed into about a dozen OWL assertions or RDF triples (formally an RDF triple is one (probably the most common) way of implementing an OWL assertion. So, to avoid confusion with assertion (and likewise OWL has a subset of assertions referred to as annotation, so switching the Arachnolingua terminology to annotation would merely change the problem), I started looking for synonyms. The best synonym for ‘assertion’ that I found seemed to be ‘claim’ – it has the advantage of not sounding definitive and suggesting the need for provenance (taking about a claim leads easily to the question ‘who’s making this claim?’). Observation was a tempting second choice – most of the ‘assertions’ in arachnolingua are observations, but not all and if I were to use the term observation in Arachnolingua, I would prefer it to refer to claims at the level of individuals – individual spiders doing a particular something on a particular substrate. 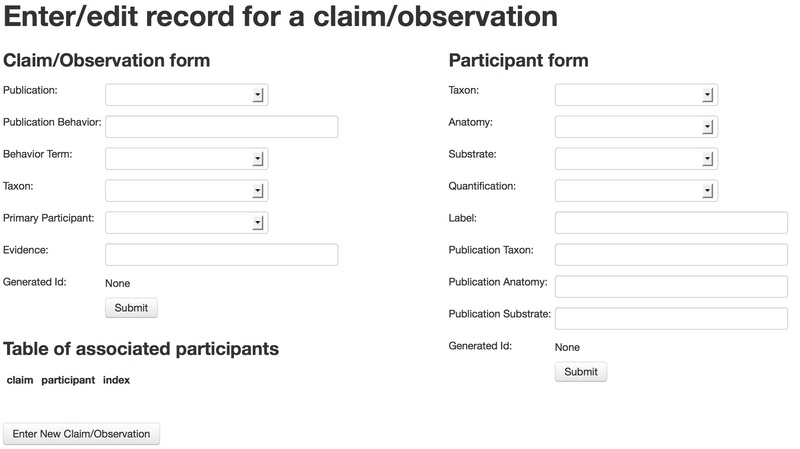 So, the software taxonomy, I could look at observations as a subclass of claims – though I haven’t yet seen the need to implement such a subclass. Changes like this are ugly, but only get uglier the longer they are put off. 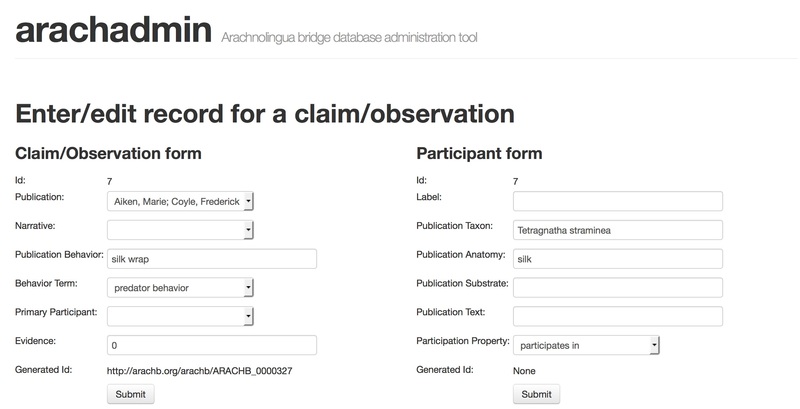 I also added lexical filtering to terms from NCBI. There are a lot of ‘taxa’ in NCBI that reflect either samples or unidentified species. As samples are individuals (or collections of individuals) their identifiers don’t belong in the taxonomy for Arachnolingua’s purposes. This is completely aside from whether any behavior data was ever collected from these individuals – I tracked down some underlying Genbank submissions and some were from old collaborators and friends in the Maddison lab so there might be some video data for some of these submissions. The worst offender in sheer quantity was the Barcode of Life and its BOLD submissions. I know NCBI is planning to move samples to a separate database, I don’t know if this only applies to new records or if existing records are moved, how quickly this will happen. So best to filter these out consistently in both curation and OWL generation. Removing these terms did provide some query speedup for the worst cases. Lots of interesting spider behavior posted to the web in the past few weeks, but this post is already long enough. I hope my northern hemisphere readers are enjoying the spring as I have. Not as much to report recently, though there has been some Arachnolingua work. The promised update of NCBI taxonomy hasn’t made it to release yet, so I’ve been concentrating on supporting non-NCBI taxa on both the curation side as well as the OWL generation side. This will probably also be the mechanism I use for introducing taxa that aren’t Arachnids but relevant to Arachnid behavior (predator, prey, substrate, etc.) since I don’t really want to manage all of NCBI (or even NCBI pruned of all the non-organismal taxonomic terms). The changes to Arachadmin are partially done and working, though merging these into the set of available terms at least needs some testing with actual curation of behavior. I’ve also added the Environmental Ontology (EnvO) and the Population and Community Ontology (PCO) to the set of support ontologies. The former will, hopefully provide some substrates as well as conditions that might affect behavior. The PCO provides terms for populations (and groups of e.g., social spiders) and will provide a link between population level processes (e.g, juvenile dispersal) and individual behaviors (e.g., ballooning). I have been somewhat involved in the later, and had the pleasure of meeting the main developer of EnvO, Pier Luigi Buttigieg, at the February RCN summit. The other task I’ve been working on is getting the OwlTools incorporated into the OwlBuilder generator. I seem to have resolved my maven issue, at least for local builds. I still need to figure out if I can define the project to allow maven to find the OwlBuilder repository somewhere when I try building on Travis. That still remains, as does integrating the ontology release tool with my own code. Although arachb will never actually be an OBO ontology, many of the OBO foundry standards are relevant and appropriate and if I can automate compliance with as many of their standards as possible, it will be a good thing. 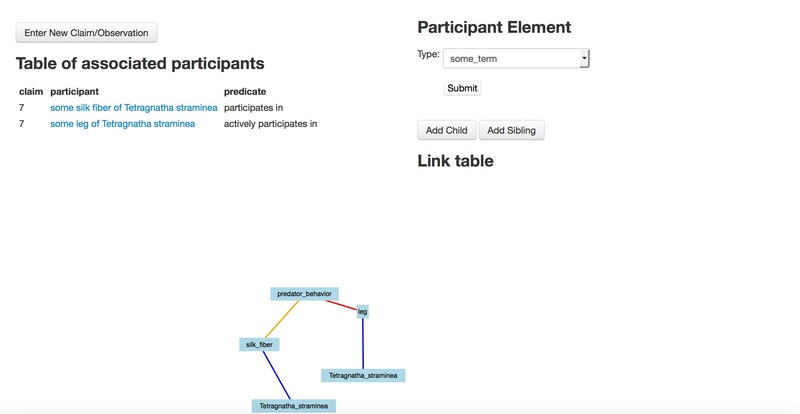 Finally not much progress on the annotation semantics work. Arachnolingua was not affected by the HeartBleed bug we all heard so much about this past week. Arguably this is for all the wrong reasons. Arachnolingua doesn’t use SSL directly or even have certificates; if the resource were actually authoritative about something, it would be worthwhile to support secure communications to prevent man-in-the-middle spoofing. Likewise, Arachadmin could be set up as a real web tool with authorized curators and the like, but the need for such has not presented itself, though if the right people were interested… So, because SSL isn’t used, Arachnolingua wasn’t affected. Nevertheless, I did update the server to the patched version of the SSL library. Meanwhile, it looks like I should update my other passwords (AWS, Namecheap, here, etc.). Some of these have already been fixed. I’m already looking forward to the summer – Evolution2014/iEvoBio and Animal Behavior 2014. Plan is definitely to do a lightning talk for iEvoBio and either a different lightning talk (different audience and emphesis) for Animal Behavior, or maybe a poster. Arachnolingua is alive and well, even if the last few weeks have been a bit of hibernation.